Hojagiri: Hojagiri is a reflection of the age-old culture and the unique style of dance of the Reang community of Tripura. Only lower half of the body is moved to create rhythmic movements. 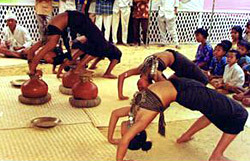 Dancers performing unusually amazing acrobatic feats is the main highlight of the dance. 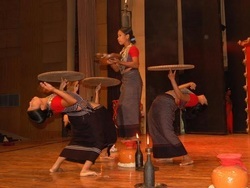 Reang girls twist and turn and dance in time to the compelling rhythm, sometimes dancing on an earthen pitcher or balancing a bottle on the head with a lighted lamp on top of it.